Egypt is a country in Africa. People have lived in that region for thousands and thousands of years – we call them the Ancient Egyptians. They settled around the Nile River, and built pyramids that you can still see there today. The Ancient Egyptians helped us learn a lot about maths, medicine and farming. They also made their own paper out of reeds called papyrus, and wrote using pictures called hieroglyphics. The Egyptians settled in northeast Africa, and that’s where the country of Egypt is today. They lived in a very dry area, but they got water from the Nile River (the longest river in the world!) so they could grow crops. Farming techniques to water crops included using machines like the sakia and the shaduf – these are still used in Egypt today. The Egyptians created paper using reeds, called papyrus. They wrote using pictures called hieroglyphics that stood for different words. Only certain people studied how to write, and they worked as scribes. Scribes were ranked in the middle of the order of social groups in Egypt – the pharaoh was at the very top of this list, and slaves were at the very bottom. The Egyptians build pyramids as places to bury their kings and queens, who were called pharaohs. The Egyptians were very good at maths – they had to be, to work out how to build pyramids so perfectly! Both men and women wore make-up. The wealthier people were, the more make-up they’d wear. Egypt was part of Greece, and then the Roman Empire. The Egyptians made paper from reeds called papyrus – it’s where we get the word ‘paper’ from! It took a long time to make papyrus, but it was easier than carrying around heavy clay tablets, which is what they did before. They wrote in pictures called hieroglyphics. Each picture means something so when you see a few different kinds of pictures in a row, you know what the writer is trying to say. 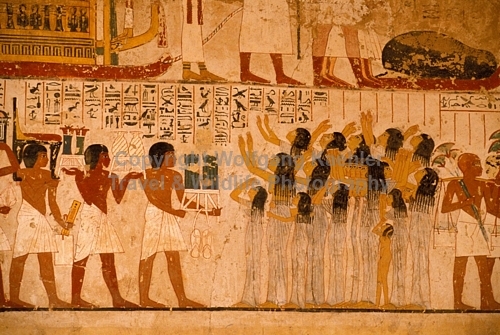 The Egyptians used pictures for writing numbers too – different pictures stood for units, tens and hundreds. 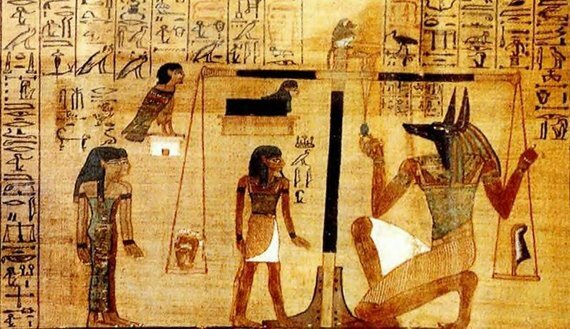 The Egyptians were very advanced at maths – they figured out how to work out tricky problems that helped other people after them understand more about maths. In fact, people who lived in other countries even knew that the Egyptians were the best at maths! The Egyptians made most of their clothes from linen, which is fabric that’s made from plants. They’d use different things to colour it, such as saffron to make it yellow and indigo to make it blue. Egyptians would shave their heads and wear wigs instead! Egyptians loved perfume, and would wear it in solid cones on their head – the cones would melt during the day and keep them smelling nice when the weather was very hot. Both men and women wore make-up. The make-up they had included black and green to wear on their eyes and eyelashes, and rouge for their cheeks. The Egyptians had a huge amount of respect for cats, and for a type of dog called a jackal. They also thought scarab beetles were very important; they represented rebirth and life after death. shaduf – a long stick that had a bucket on a rope on one end, and a heavy weight on the other; to water a field, the farmer would pull down on the weighted end so the bucket would come up, then swing the whole thing around to water a field next to the river. Because farmers grew crops near the Nile, they had to schedule their growing season around times when the Nile flooded. This happened every year during June to September, so they’d plant new crops in October that would be ready to harvest in March. By the end of May, all of the crops would have been harvested in time for the Nile to flood again. Egyptian farmers also had oxen pull ploughs through fields. We know about their farming techniques because of the paintings that archaeologists have found that the Egyptians made. The paintings show all sorts of things that the Egyptians did, such as tending livestock and harvesting the crops. Make-up wasn’t always worn to dress up. Some make-up had practical uses as well, like black kohl used around the eyes. It shielded eyes from the sun, and it was also a kind of disinfectant that protected against eye diseases. The papyrus that Egyptians made came from reeds that grew along the Nile River, which were called papyrus. To make paper, they would cut papyrus reeds into strips and spend quite a few days soaking them, rolling them out and repeating that process until the reeds were very thin. All of the thin reeds would be pounded together and clamped down to dry, then polished to smooth it out – the result was a thin yet very strong sheet that was ready to be written or drawn on. The papyrus reeds were actually used for a lot of things besides paper. It was good for making mats to put on the floor, twisting into rope, plaiting together to make boats, and weaving to make baskets and sandals. The Egyptians also ate it, and used it to make different medicines. The Egyptians made a lot of discoveries about medicine. We know this from reading what they wrote on papyrus, discovered later by archaeologists. They understood about heartbeats and listening for a healthy pulse, and knew how the body and organs worked because of the process of making mummies. They also learned about the ways that different plants healed different illnesses and injuries, such as aloe vera being good for healing burns. Pharaoh – The pharaoh was at the top of the order, and thought to be a god. Vizier – Every pharaoh had a vizier; they were an advisor, they ran the pharaoh’s household, they acted as a judge, and they made sure that the Egyptians had enough food. Nobles and priests – Nobles included doctors, lawyers and military leaders. Priests were the ones who made sure the god in their temple was happy, and that they understood any messages the god was trying to say to them. Scribes and soldiers – Scribes were the only ones who were taught how to write; people in other professions (like priests) may have studied to be a scribe as well, but they could also have just hired someone to write things down for them. Being a soldier was a choice; they were given land to live on after they finished serving in the army. Craftsmen – This was a large group that included anyone who had a trade, such as potters, tailors, painters and blacksmiths. Farmers and slaves – The pharaoh and nobles hired farmers to work for them, and grow crops on their land; as payment, the farmers had a place to live, clothes to wear and food to eat. Slaves were people who were captured in battles with other civilisations, and they worked in the homes of the pharaoh and nobles or in temples. Walk around the Sphinx, clamber inside the Great Pyramid of Giza and seek out the pharaoh's burial chamber! Write using a hieroglyphic typerwriter! At the British Museum, you can see the Rosetta Stone and a statue of King Ramesses II. Browse through a huge collection of Egyptian artefacts at the Manchester Museum. Watch this video about writing used in Ancient Egypt. Find out about living near the Nile, and farming techniques used by Egyptians today. See how farming worked in Ancient Egypt. Find out about everyday life in Ancient Egypt. Look closely at Egyptian statues.